Viva La Migra! - Long Live Immigration! Viva La Migra - Long Live Immigration! The biggest concern we have now is getting a border wall across our complete state. Hundreds of miles are only protected by these X barriers, which as you can see offer no protection against simply walking across the border. All in all, encouraging legal immigration, enforcing laws against illegal entry, protecting our borders, and our Border Patrol officers, is a huge priority to those of us that live here. As a citizen of Columbus New Mexico (A port of entry border town with Palomas Mexico) I can tell you border security has been tremendously beefed up in recent years. In fact, we just opened a brand new, state of the art, Port of Entry facility. The U.S. Government calling it the finest POE facility ever built in the United States. Over the last 20 years we have seen the tide change from illegal immigrants literally walking through our town everyday on their way up to Interstate 10, to virtually no sign of them at all. What we see now are large numbers of Border Patrol trucks, agents, quad runners, and the buzz-by of their helicopters. This is a major shift, back in the hay day, housing the illegal traffic for a a day or two was a cottage industry in our small village for those who had a spare room or shelter. Having married a Mexican citizen, I can tell you the process of getting her residency was a bit of a muddle, but with patience, and the understanding that in these parts of country (El Paso corridor), the Immigration and Naturalization agency has their hands full. All in all we accomplished the task in relatively short order. We then went on to getting her citizenship. The whole process took about 5 years. The Field Operations division was responsible for overseeing INS' many offices operating throughout the country and the world. The Field Operations division implemented policies and handled tasks for its three regional offices, which in turn oversaw 33 districts and 21 border areas throughout the country. Internationally, the Field Operations division oversaw the Headquarters Office of International Affairs which in turn oversaw 16 offices outside the country. Managerial functions of the INS included the Policy and Planning and Management divisions. The Office of Policy and Planning coordinated all information for the INS and communicated with other cooperating government agencies and the public. The office is divided into three areas: the Policy Division; the Planning Division; and the Evaluation and Research Center. The second managerial division, called the Management division, was responsible for maintaining the overall mission of the INS throughout its many offices and providing administrative services to these offices. These duties were handled by the offices of Information Resources Management, Finance, Human Resources and Administration, and Equal Employment Opportunity. Shortly after the U.S. Civil War, some states started to pass their own immigration laws, which prompted the U.S. Supreme Court to rule in 1875 that immigration was a federal responsibility. The Immigration Act of 1891 established an Office of the Superintendent of Immigration within the Treasury Department. This office was responsible for admitting, rejecting, and processing all immigrants seeking admission to the United States and for implementing national immigration policy. 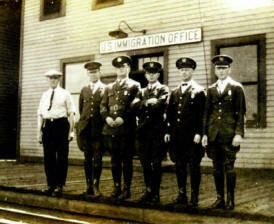 'Immigrant Inspectors', as they were called then, were stationed at major U.S. ports of entry collecting manifests of arriving passengers. Its largest station was located on Ellis Island in New York harbor. Among other things, a 'head tax' of fifty cents was collected on each immigrant. Paralleling some current immigration concerns, in the early 1900s Congress's primary interest in immigration was to protect American workers and wages: the reason it had become a federal concern in the first place. This made immigration more a matter of commerce than revenue. In 1903, Congress transferred the Bureau of Immigration to the newly created (now-defunct) Department of Commerce and Labor. After World War I, Congress attempted to stem the flow of immigrants, still mainly coming from Europe, by passing a law in 1921 and the Immigration Act of 1924 limiting the number of newcomers by assigning a quota to each nationality based upon its representation in previous U.S. Census figures. Each year, the U.S. State Department issued a limited number of visas; only those immigrants who could present valid visas were permitted entry. President Franklin Roosevelt moved the INS from the Department of Labor to the Department of Justice in 1940. In November 1979, Attorney General Benjamin Civiletti announced that INS raids would only take place at places of work, not at residences where illegal immigrants were suspected to live. The United States Immigration and Naturalization Service (INS) was a part of the United States Department of Justice and handled legal and illegal immigration and naturalization. It ceased to exist on March 1, 2003. Most of its functions were transferred to three new agencies within the newly created Department of Homeland Security in March 2003. The administration of immigration services, including permanent residence, naturalization, asylum, and other functions became the responsibility of the Bureau of Citizenship and Immigration Services (BCIS), which existed only for a short time before changing to its current name, U.S. Citizenship and Immigration Services (USCIS). The investigative and enforcement functions (including investigations, deportation, and intelligence) were combined with U.S. Customs investigators, the Federal Protective Service, and the Federal Air Marshal Service, to create U.S. Immigration and Customs Enforcement (ICE). The border functions of the INS, which included the Border Patrol along with INS Inspectors, were combined with U.S. Customs Inspectors into the newly created U.S. Customs and Border Protection (CBP). INS protected and enforced the laws of naturalization, the process by which a foreign-born person becomes a citizen. The INS also tackled illegal entrance into the United States, preventing receipt of benefits such as social security or unemployment by those ineligible to receive them, and investigated, detained, and deported those illegally living in the United States. At the head of the INS was a commissioner appointed by the president who reported to the Attorney General in the Department of Justice. The INS worked closely with the United Nations, the Department of State, and the Department of Health and Human Services. The INS was a very large and complex organization that had four main divisions—Programs, Field Operations, Policy and Planning, and Management—that were responsible for operations and management. The operational functions of the INS included the Programs and Field Operations divisions. The Programs division was responsible for handling all the functions involved with enforcement and examinations, including the arrest, detaining, and deportation of illegal immigrants as well as controlling illegal and legal entry. 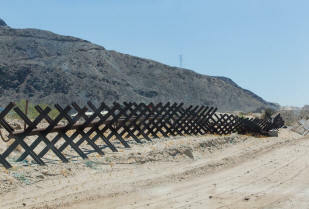 STUDY: The Price of Illegal Immigration on US. And the Old Testament Price of Legal Immigration and Sanctuary. Here's some straight talk about the burden on the American taxpayer caused by illegal immigration. Pastor Joe Cortes of Faith Cometh By Hearing ministries sheds the light on this subject through an analysis of the "The Fiscal Burden of Illegal Immigration on United States Taxpayers" presented by the Federation of American Immigration Reform or F.A.I.R. Pastor Cortes continues on in this study with what the Bible has to say about immigration and sanctuary cities. If you think the enormous cost of illegal immigration in America is painful, wait until you hear about the cost of legal immigration in the Old Testament days in Israel. OUCH! Look for the "Teaching Center" link.